Welcome to D A I L Y T E X T U R E . C O M where I help you turn your photos into ART! See The Textures and Backgrounds! 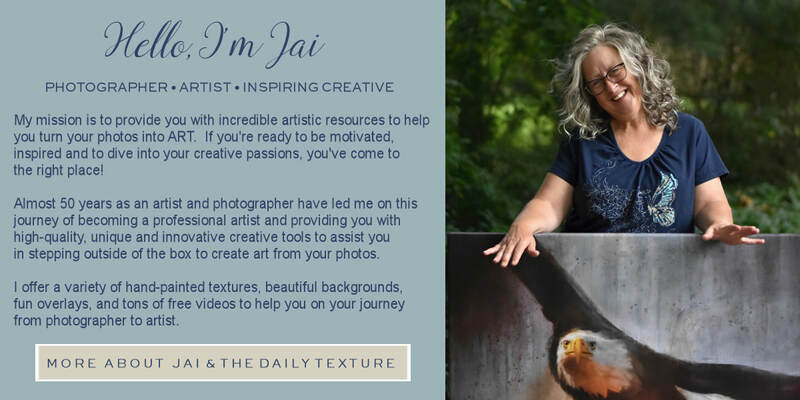 ​The Daily Texture features original hand painted, luminous and dramatic backgrounds, textures, overlays and more by Tennessee fine artist Jai Johnson. 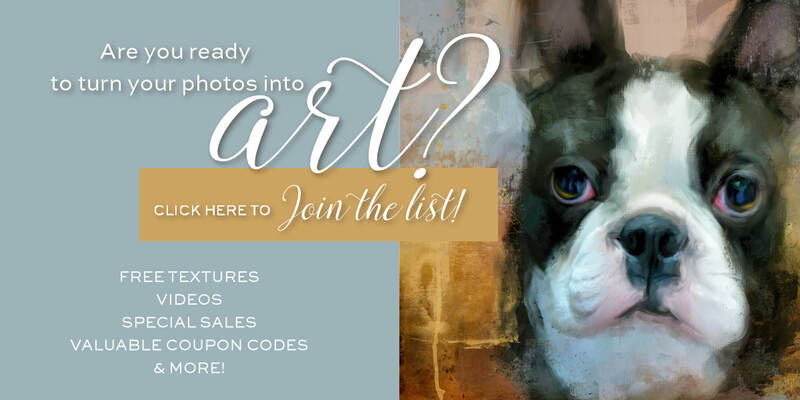 The rich textured backgrounds offered by this worldwide licensed artist assist in transforming photographs and subjects into works of fine art, moving them beyond the realm of general photography into unique art filled with light and depth. If you're a photographer, designer, artist, digital painter or digital scrapbooking enthusiast and you've been enjoying The Daily Texture since 2014, you'll love our new Daily Texture Collections, available exclusively here at the DailyTexture.Com Shop! You'll find new, expanded collections of textures and digital backgrounds for photographers, artists and painters, all designed to compliment and work with each other to create a body of work in a similar style. Following our video tutorials, you can easily merge a subject within a texture or background to create a new work of art and take your photo to the next level. Digital painters love our textures and background collections too, often using them as the base layer to start their painting, saving time and inspiring new, creative works of art. The original individual Daily Textures are also in the shop! You can purchase the individual textures one at a time as you need them, the monthly bundles, or you can add your own personal selections to your cart to create your very own texture bundle. You have given me the inspiration to go beyond just basic editing with my images and into a new world I never knew existing before finding you. A VERY SINCERE THANK YOU for doing this. It means a lot to me that I just can't put into words how I feel. - R.L. I love all of your textures and videos. You have opened up a whole new world for me and my photos. You're the best! God Bless! --T.A. Looking through your collection of work and then watching your videos made me more excited about photography then I have been in a really long time. I have created more work in the past week then I have in over a year! I know I have a lot to catch up on but it's so nice to feel excited about my work again! Thank you for teaching me something new and different and helping me get back something I love!! --S.H. I found the Daily Texture page a couple months ago now Jai. I just wanted to tell you how much I enjoy your textures, videos, and creating my own digital art with them. - J.D. ​As I begin to use your textures, I must say that they are the highest quality of any on the market that I've seen. I have purchased hundreds of digital assets for use in my photography and digital paintings for many years and your textures and backgrounds are fast becoming my favorites. Just wanted to say thanks. --C.R. I just wanted to say thank you so much for your fantastic tutorials and showing how to use your fabulous textures better. T.H. I just wanted to say Thank You for all the beautiful textures you create!!! I am totally addicted to yours!!! I have more of your textures and use them more often than any others!!!! I do a lot of equine photography and love adding your textures to take out backgrounds that are less than wonderful. Your textures make my images stand out and I am able to create such wonderful works of art. - K.B. I have been photographing since the age of 7 and just had my 82nd birthday. Never been more excited about photography. Your techniques and creative bent are fascinating. - E.D. If you want to join a thriving community of artists creating art from their photos, click here to join The Daily Texture private Facebook group! ​and scrapbooking enthusiasts worldwide to enhance their artistic projects ​and take their work to a new level of artistry! All textures/backgrounds include a commercial use license. Read more about the Daily Texture project here.